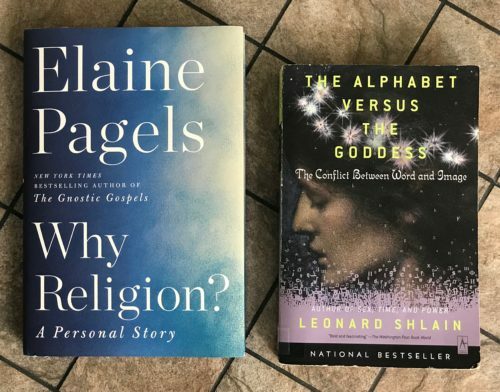 This entry was tagged A Grief Observed, CS Lewis, Elaine Pagels, god of wrath, Leonard Shlain, Merida English Library, rage, satan, spiritual healing, The Alphabet Versus the Goddess, Tinker Hatfield, Why Religion?. Bookmark the permalink. ← ASSIMILATION : Todos Somos Extraños ; ¿¿We’re All Outsiders?? Another powerful story about loss and recovery, linked below, fits well with the Pagels book. The story is about an athlete who had a scholarship, but was so seriously injured in his sport that he could no longer hold the scholarship. His coach stood by him, and insisted the school find other studies. “Everyone has a religion. It is, in fact, impossible not to have a religion if you are a human being. It’s in our genes and has expressed itself in every culture, in every age, including our own secularized husk of a society. “By religion, I mean something quite specific: a practice not a theory; a way of life that gives meaning, a meaning that cannot really be defended without recourse to some transcendent value, undying “Truth” or God (or gods).